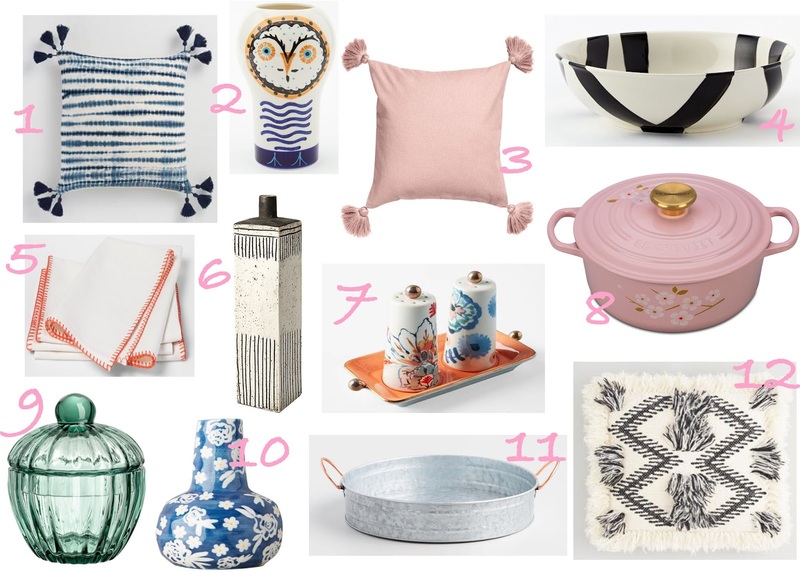 In lieu of Wishlist Wednesday this week I thought it might be a good time to share some Spring home decor finds. I love to move things around in my home and absolutely love Spring cleaning and a good Spring refresh! Recently I bought some fresh eucalyptus at Trader Joes and arranged it in a vase on my dining room buffet. The light ash green color of the eucalyptus brings such a soft pop of color that I am really enjoying. Fresh flowers and plants are always a quick and easy refresh to add. Did you know that Amazon sells plants? If you have Amazon Prime with free two day shipping you don't have to leave your home for plant shopping! Here is the link to shop Amazon's pants... Amazon Plant Shop. The addition of the fresh eucalyptus was my first step into refreshing my home for the Spring season. I still plan on swapping out my couch and love seat pillows and adding a little something to my dining room table and main floor bathroom (the guest bath). I also plan on buying a new rug for my front door entrance, unfortunately I have struck out in my search so far (insert sad face). But I have found a great deal of Spring home decor items that I'd love to see in my home or in any home, aka your home. 1. Indigo Tie Dye Ripple Throw Pillow $35 This tie dye pillow will come to live with me this Spring (on my cream love seat). The tassels are playful and the tie dye adds a pop of color with out being solid or too bold. 2. Fairy Tale Vase $23 (on sale) How cute is this little vase?! There are 3 other vases in this set, one is is teal colored llama. I also love the snow globes from West Elm. Like this cactus snow globe. Last year I bought a flamingo snow globe from West Elm that they no longer sell. 3. Cushion Cover with Tassels $12.99 I obviously have a thing for tassels. This cushion cover also comes in dusky green (which I also love), yellow and orange. I like to use cushion covers instead of buying full pillows for storage reasons and these are so affordable! 4. Mixed Pattern Bowl $12 (on sale) This bowl also comes in a rice bowl size/ option, both are on sale. I like the low bowl as a decorative piece and ordered it already. But I am sure in the future, at some gathering, I'll use it for serving too. For $12 it is a steal! 5. Off White Napkin $9.99 I don't normally do orange anywhere in my house but the embroidered edge of this napkin does orange subtly, which like. I think it would be a perfect napkin to use for a Spring gathering, maybe Mother's Day? They would look great against blue or green plates. 6. Empoli Tall Rectangular Vase $129 Sorry, this vase is a little pricy compared to my other picks but it is simple with a modern and rustic design. I just love it. And it is 18 inches tall, a big guy. 7. Eres Salt & Pepper Shakers with Tray $20 This salt and pepper shaker set is one of my favorite pieces of the new Nordstrom X Anthropologie collaboration. You can shop the whole collaboration here. If I end up hosting Mother's Day this year or any kind of intimate gathering soon I will probably order this set. I love the print and colors on this set, they are delicate and gorgeous and would add sweet accent to any table setting. 8. Le Creuset Signature Sakura 2.75-Qt. French Dutch Oven $325 (on sale) In my dream kitchen I would have a large 6 burner gas stove where this gal would sit just showing off during the Spring and Summer. Le Creuset Dutch Ovens are already a classy kitchen staple and this version steps it up with it's Sakura floral details. It also comes in white with pink floral details. 9. Glass Container $12.99 This little glass container also comes in pink glass and clear glass. It is an inexpensive and easy way to add color to any powder room or guest bathroom. You could fill it with cotton balls, small soaps or even dried rose petals. 10. Welcome Spring Vase $20 Another piece from the Nordstrom X Anthropologie collab. I plan on ordering this for my friend who has a Summer birthday. It would also be a perfect hostess gift, with a garden rose or two. 11. Galvanized Metal And Copper Tray $20 This tray is giving off Spring garden vibes and I can see it sitting in the center of a kitchen island or dining room table, holding napkins and a succulent or two. I also like these galvanized metal wall planters in the small oval size for $25, in the large oval size for $35, in the small half circle for $20 and the large half circle for $25. 12. Black And White Woven Fringe Throw Pillow $30 I like this pillow as an accent in the bedroom. The fringe is playful, giving the look a bit of desert or even Coachella vibes. More than the pattern I really like the depth the texture can add to any room.